Following many years of annual bazaars as fund-raisers for St. Paul's Parochial-Elementary School, a three-day week-end was announced for the 1977 Seafood Festival. Sam Armato and Russell Ringer were hand-picked by Father O’Brien as co-chairmen; with Ben Carrubba as treasurer; and Dave McCutchon in charge of publicity. Seafood was promoted as a choice of "take out" or "eat-in." An official proclamation was issued, by then Governor Cliff Finch, declaring the week-end as "The First Annual Coast Seafood Festival Week-End" followed by Mayor Zach Anthony placing a crown upon Barbara Davis as Seafood Festival Queen. Scenic Drive was closed to street dancing while adults and kiddies were engaged in cast net throwing contests or boy's softball tournaments. The day was topped off with a baby contest. Food servings were ample, with selections of gumbo, boiled shrimp, boiled crabs, fresh fried mullet, hamburgers, barbecued chicken, watermelon, cakes, and candies. As part of the 3-day event, an arts and crafts exhibit was presented by the Mississippi Gulf Coast Craftsmen's Guild while music entertainment was provided by the U.S. Air Force Band. In 1979, the U.S. Navy Steel Band with twenty-three specially designed 55-gallon oil drums titillated the crowds with calypso music. Other attractions, included, Diedre and Kasim performing as Mid-East belly dancers and the first annual Tennis Tournament was introduced. In 1983, the 5000 meter run and 1-mile run were added; and by 1986, food varieties included stuffed-crabs, seafood dinners, po-boys, and Tom Anthony's special gumbo. Live entertainment included Keesler's "Blue Edition" concert band and the first sand sculpture contest. Creole jambalaya was savored in 1989, while 22 game booths held the attention of young and old. In 1984, when Sam Armato died, the Festival was dedicated in his honor for his years of service as Co-founder. Sam’s daughter, Marian Torgeson, recalled that during one of the early years, a large hot-air balloon was featured, offering rides to prospects. 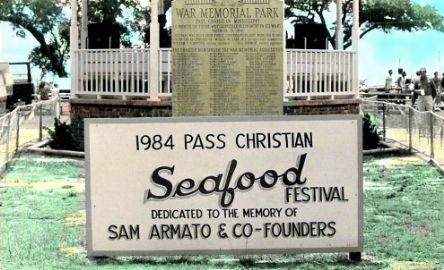 After nearly 15 years at War Memorial Park, in 1991, the Seafood Festival was moved to St Paul's school grounds, and in 1992, the annual event received national fame by being listed in the World Book Encyclopedia. In 1993, a T-Shirt design contest was held. Both, in 1993 and 1994, the event made the front cover of the Sun Herald's "Marquis". In 1996, celebrating its 20th Year, the Seafood Festival was spread along Highway 90 in its new park expansion fronting the school and church. A very successful year was had as neighboring Parish members, the Pass Christian community, and the entire coast made the 3-day week-end a totally thrilling event. With each year has passed since the original co-founders, new persons were called on or who stepped forward to volunteer their services. Family after family took their turn in doing whatever was needed to create monies for the school while offering community enjoyment in gathering each year. Crafts, silent auctions, rides, and specialty foods were added and the festival became a major fund raiser to supplement the needs of St. Paul Elementary. When the event was changed from its regular July 4th weekend to the first week of June, profits and participation expanded. Some of the same family members who worked so hard in volunteer efforts for their children, often return to help toward the educational benefits for their grand-children.